Dit resort heeft de meest uitgebreide lijst van activiteiten in Panama City Beach. Twaalf totale zwembaden met de 11.000 vierkante voet Polynesische zwembad. Twaalf all-weather Plexicushion tennisbanen. Een negen-holes executive golfbaan. Compleet Pro Shop faciliteiten voor zowel golf en tennis. Het resort biedt complete fitness faciliteiten, evenals massages voor alle gasten. Een wellness-programma bestaande uit low-impact, stap en aqua aerobics wordt dagelijks onderwezen. Sjoelen, game room, en een scala aan activiteiten aan het water. Deze twee slaapkamers / twee badkamers Deluxe 'A' complex heeft een prachtig panoramisch uitzicht op de oceaan en is volledig uitgerust. Huur de beste voor een stuk minder door direct te huren van de eigenaar. Condo was beautiful clean with a beautiful view of the beach. Would stay here again. We greatly appreciate your business!! Thank you for taking the time to write a review and hope to see you back at the beach soon!!! Everything was really clean and well taken care of! We have stayed in several VRBO properties and this was one of our favorites! Loved our stay!! Highly recommend! We loved our room everything was clean and pretty. Beds were so comfortable I wanted to take them home. And the view in our master bedroom was breathtaking with floor to ceiling windows!!! The owner Trina that we went through was very helpful answered every call and replied to messages very fast! The resort was perfect with activities for everyone every night. Can not say enough good thing highly highly recommend staying here through Holloway rentals. She gave us exactly what we wanted in a room for cheaper than going through resort. Will most definitely be back!! We are thrilled that you enjoyed your stay and the condo. Love to have you back soon!! Trina was a pleasure to work with. Communication was easy and always fast. Everything was provided in this condo for an extended stay with 2 families. Towels, linens, and the kitchen is equipped for cooking meals. Bedrooms were very large and the beds were Very comfortable. The view was beautiful from the Master suite and balcony. This gated resort is so nice and you actually feel comfortable letting the kiddos have a little space to run around. The pool is Huge, Beautiful, and Relaxing. And the beach is just down the steps. We will be back as soon as spring arrives. We stay in Panama City a lot and you just can't do any better than this. I greatly appreciate you taking the time to review our condo. I'm sure this will be helpful for those searching the many condos listed on this site. Hope to have you stay us again very soon!! The condo was clean and fully equipped with everything you'd expect it to have. We've rented from VRBO for years and Trina was one of the easiest people to work with. The condo looked exactly like the pictures posted. Amazing stay for a perfect vacation!!! This was one of the best vacations we ever could imagine. Everything was so perfect about the house, the location, the cleanliness, the area and the amenities in the house. The furniture and beds were super nice and comfortable. 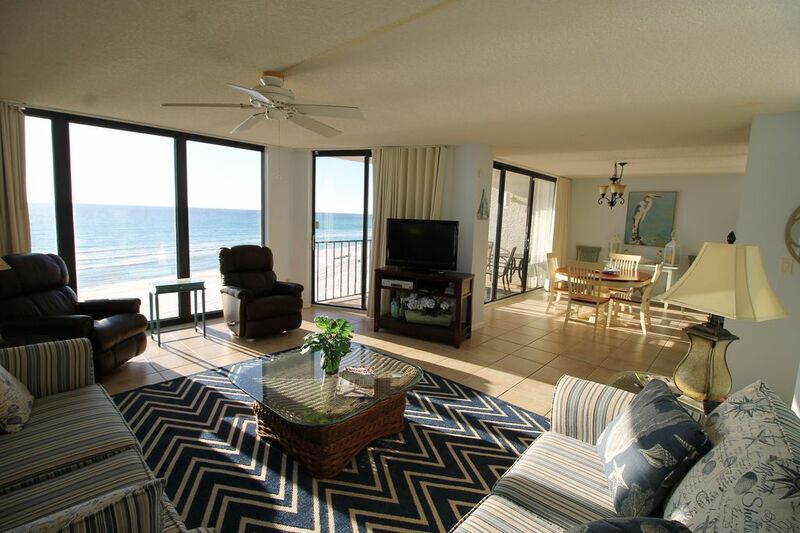 The condos have an amazing-breath taking views of the ocean. The pool and hot tubs were very easily accessible. Moreover, the person from whom we rented was a super nice and friendly person. She was very helpful to answer all of our questions. I would surely recommend this place to everyone.